Yesterday saw the end of the Fall 2014 eclipse season. If you look carefully in the upper right corner of this AIA 211 sequence you can see the limb of the Earth. The image at 0629 UTC looks dimmer and the corona is missing because of the atmosphere of the Earth absorbing the sunlight. The image is darker over most of the polar cap, although that is easier to see if you use the SDO data browser. Select the times for 22-Sept-2014 and AIA 211 to watch the dimming of the Sun caused by the atmosphere of the Earth. 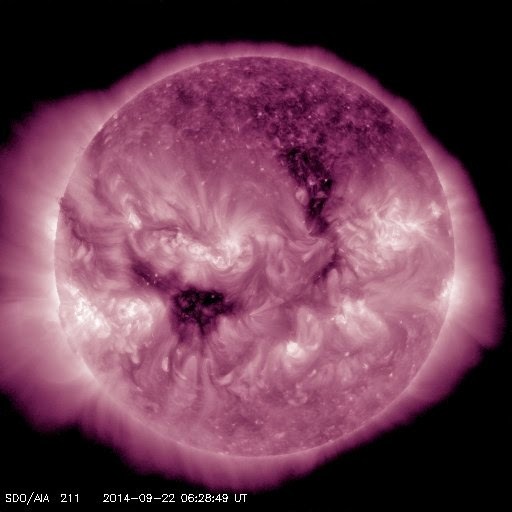 The Sun appears dimmer in the upper right corner where the Earth's atmosphere is absorbing the EUV light. Our next lunar transit is Wednesday, 24-Sept-2014, from 0650-0720 UTC (2:50-3:20 am ET). This movie from the SDO FDS team shows that the Moon will cover less than half of the solar disk during this transit. There are a lot of bright active regions in that part of the Sun, so the sharp edge of the Moon will probably cover something interesting. Our last lunar transit is 22-Nov-2014, from 2225-2305 UTC (5:25-6:05 pm ET). This movie from the SDO FDS team shows that the Moon will cover only a small part of the Sun during this transit. There aren't a lot of bright active regions in that part of the Sun, but the sharp edge of the Moon often covers something interesting. This is the fourth and final lunar transit that SDO will see in 2014. Edited 14:45 ET to correct the movie of tomorrow's transit. Stationkeeping burn #9 will happen today (September 10, 2014) at 2215 UTC (6:15 p.m. ET). 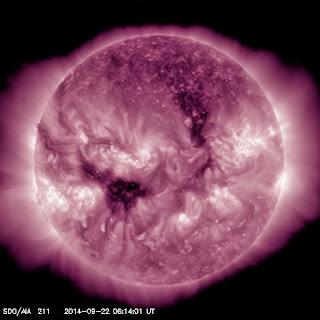 SDO data will be unavailable for about 30 minutes starting 2200 UTC (6:00 p.m. ET). This burn was delayed from last Wednesday when we became concerned about another satellite whose orbit would have come close to SDO after the burn. Today the sun let loose a X1.6 flare, starting at 1721 and peaking at 1745 UTC.